The cutting machine is widely applicable to cutting of various nonmetal materials by die cutter,such as plastic glove ,rubber, cloth and so on. 1.Operation with two hands,safe and reliable. 2.Double oil cylinder and precise double-crank connecting rod balancing mechanism are adopted,which can gurantee that the cutting depth at every cutting position is same. 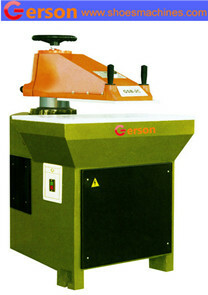 3.Easy to operate,the swing arm cutting machine is very quick and easy. 4.Die cutter pneumatic clamp device can be allocated to make the replacement of die cutter convenient and prompt. 5.Operator to the lowest degree of fatigue.